FILE - Scientist He Jiankui shows "The Human Genome", a book he edited, at his company Direct Genomics in Shenzhen, Guangdong province, China, Aug. 4, 2016. 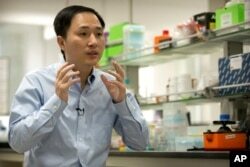 A Chinese researcher’s surprise claim that he is the first person in the world to successfully edit the genes of a pair of recently born twin girls, making them resistant to HIV, the AIDS virus, has been met with criticism, scorn and denial in China. Provincial health authorities in the southern province of Guangdong released a statement Tuesday announcing that an investigation into the experiment, which involved seven couples and one successful pregnancy, already is under way and being given utmost attention. “Results of the investigation will be promptly released to the public,” the statement said. China’s Ministry of Health said it was placing a high priority on the case and that it ordered the probe. Meanwhile, those who supposedly were involved in approving an ethical review of the experiment that He Jiankui said he conducted are distancing themselves. He is an associate professor at the Southern University of Science and Technology, but his employer has said that the researcher has been on leave without pay since February and that the school was not aware of the experiment. The Shenzhen Health and Family Planning Commission said it had not received an ethical assessment application for the study. According to a form posted online, the city’s science and innovation committee was listed as backing the experiment, something the panel denies. The Shenzhen Harmonicare Hospital was listed as having given ethical approval for He’s experiment, although the hospital is denying this. According to Reuters, Hong Kong-listed Harmonicare Medical Holdings has issued a statement saying the signatures on the form posted online are suspected of having been forged and that "no relevant meeting of the Medical Ethics Committee of the hospital, in fact, took place." In its exclusive report on the experiment released Monday, the Associated Press noted that He Jiankui gave official notice of his trial to authorities on November 8, long after his research had begun and during the same month that the two baby girls — Lulu and Nana — were born. It was clear from He’s interview with AP, that He knew what he was getting himself into. He told AP he was aware of the possible ramifications for future research. “I feel a strong responsibility that it’s not just to make a first, but also make it an example,” He said. 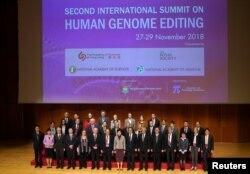 He currently is in Hong Kong and is expected to deliver a speech at the University of Hong Kong on Wednesday at a summit on human genome editing. Revelations of the experiment were quickly met with criticism, both and home and abroad, although in China, the pushback was particularly sharp. Shortly after news broke on Monday, 122 scientists issued an open letter warning that the gene editing tool used in the experiment, the CRISPR-Cas 9 technology, was risky. The scientists also voiced concern the experiment could harm the reputation and development of China's biomedical community. The Chinese news website the Paper posted a copy of the statement online in which the scientists said, "Pandora's box has been opened. We still might have a glimmer of hope to close it before it's too late." They also said the biomedical ethics review for the so-called research existed only in name. “Conducting direct human experiments can only be described as crazy," they said. On social media in China, however, some were optimistic and exuberant about the prospects the claimed breakthrough could bring to fighting disease. Others were worried about the bigger ramifications. Liu Wei, a Chinese scientist, said that right now there still are too many uncertainties, adding that the technology has the capability of becoming a genetic version of Frankenstein. “People are not quite clear about the long-term function of every gene yet. Based on the knowledge we have now, modifying the gene could avoid one disease but may bring about other problems,” Liu noted. He added that since the technology is cutting-edge there is a big risk those involved in the review process lack the understanding needed, which could lead to negligence. Gene-Edited Food Coming, But Will Shoppers Buy?